Payoneer is only available as an Airbnb payout method in certain countries at this time. To see if it’s available to you, look for it when you add a payout method. If the option appears for your selected country, you’ll be able to sign up for Payoneer—if you already have a Payoneer card, contact them to connect Airbnb payouts to your existing account. When you sign up for Payoneer as a new customer with Airbnb, be sure that you enter the same address that you provided on the Airbnb payout method page. After signing up, Payoneer will approve your details or ask for additional information (like a copy of your government issued ID or Social Security card) by email within 2 days. When approved by Payoneer, a card will be mailed to you within 4-15 business days. You need to activate the card to receive funds. If you don’t receive the card, please contact Payoneer customer service. Payoneer allows you to receive payouts directly to a Payoneer Prepaid Debit MasterCard. Once activated, Airbnb will load your payouts in USD or EUR, depending on your country, and you can view your balance on Payoneer’s website. Airbnb releases payouts approximately 24 hours after the check-in date, and Payoneer typically delivers the funds to your account within 1-3 hours. Payoneer applies fees for certain transactions, some of which are listed below. Additionally, there are fees for transactions originated outside of the Payoneer country of issuance. Sign up for Payoneer account. 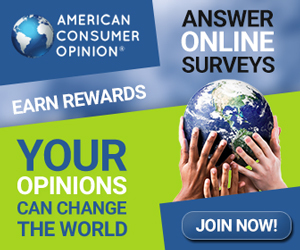 To start off, use my link here and you can earn your first $25 (as soon as you load $100). To sign up you’ll need a scanned copy(image) of your Government ID and a proper mailing address (PO BOX recommended). Make sure your Payoneer account name/ address matches the info on your official Govt ID . You can actually get the MasterCard via your national post office or mailing service for free but that method can take up to three weeks. If you want to get the card within 3-5 days you can use expedite shipping services like DHL and FedEx for certain fees. Once you get the card via mail, well, the next step is to open the envelop and then remove your shiny MasterCard attached to a paper containing details of your Payoneer account- keep this paper safe or back it up for later. Sign in to your payoneer account and then go to My Account >> Activate Card. Enter your MasterCard number and enter a new 4 digit pin code which you will use to withdraw cash from your local ATM. Save the pin number in a safe place. You can change the pin code anytime by logging into your account. Now on the left corner you will see a “Refer a Friend” banner. Click it. You will be redirected to a page where you will get your Payoneer affiliate link. You can refer your friends via Facebook, Twitter and Email. If you want to follow along with this bitcoin core tutorial you should download bitcoin core and let it synchronize first. When you start Bitcoin Core it will take a long time to synchronize with the Bitcoin network because the software has to download the entire blockchain, which contains over five years of global transaction history. Once you are synced the program will know the balance of every bitcoin address in existence and can verify when you send or receive bitcoins in real time. Don’t have any bitcoin yet? Get started with Localbitcoins.com, its easy to buy small amount of bitcoin. The first thing you should do is Encrypt your wallet. 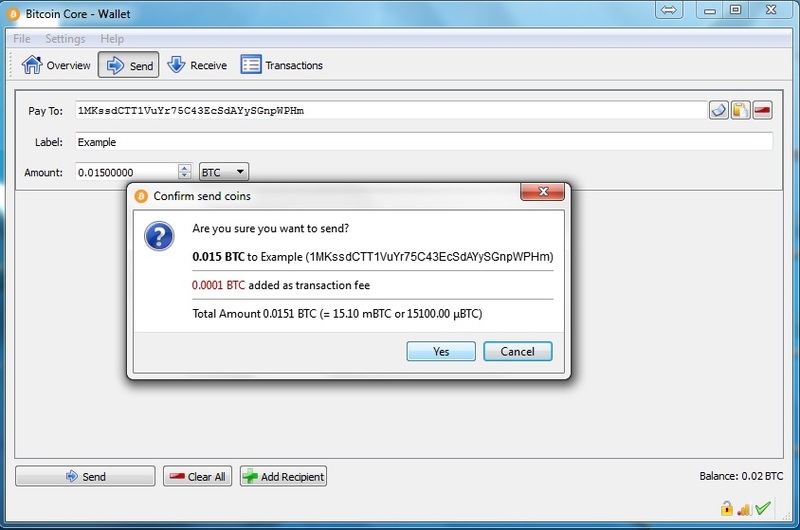 Encrypting your wallet will password protect all of your bitcoin addresses. If you do not encrypt your wallet, anyone with access to your computer can take your bitcoins. There is no recovery process for this password so don’t forget it or all your bitcoins may be lost forever. Once you have completed all the steps Bitcoin Core will have to restart to complete the process. Once you have Encrypted your wallet, you should backup your wallet file on an external hard drive or USB flash drive. Your wallet file (wallet.dat) stores the data for all of your public & private keys. If you lose this data, you will lose the bitcoin in all of those bitcoin addresses. Anytime you create a new bitcoin address or send bitcoins to someone, Bitcoin Core will add that new information to your wallet.dat file so it is best practice to backup your wallet file regularly. 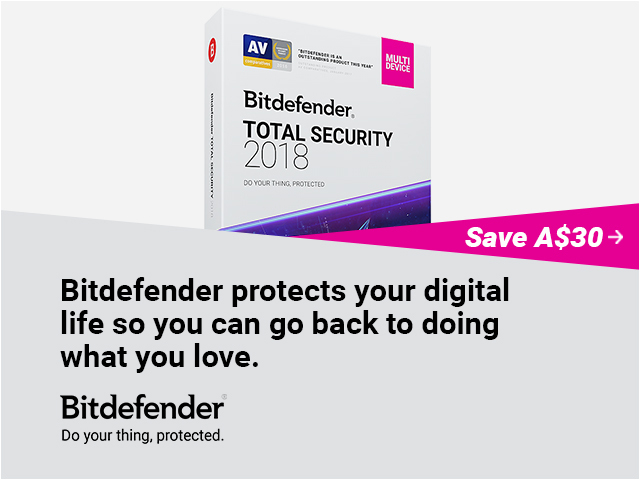 Now that you are backed up, click under File and go to ‘receiving addresses’. This contains a list of your public keys, they appear as a long string of characters. Most bitcoin addresses start with a 1, but multisig wallets may generate bitcoin addresses that start with a 3 but you don’t need to learn multi-signature for this bitcoin core tutorial. At this point you are ready to accept bitcoin. You can share this address with anyone you want to receive money from. I’m going to send myself 0.01 bitcoin from a different wallet, not shown in this bitcoin core tutorial. Depending on the sending wallet the transaction will appear instantly or it may take a few minutes. In this case it took about 15 seconds to show up, and a little notification popped up to let me know to check my Bitcoin Core wallet. 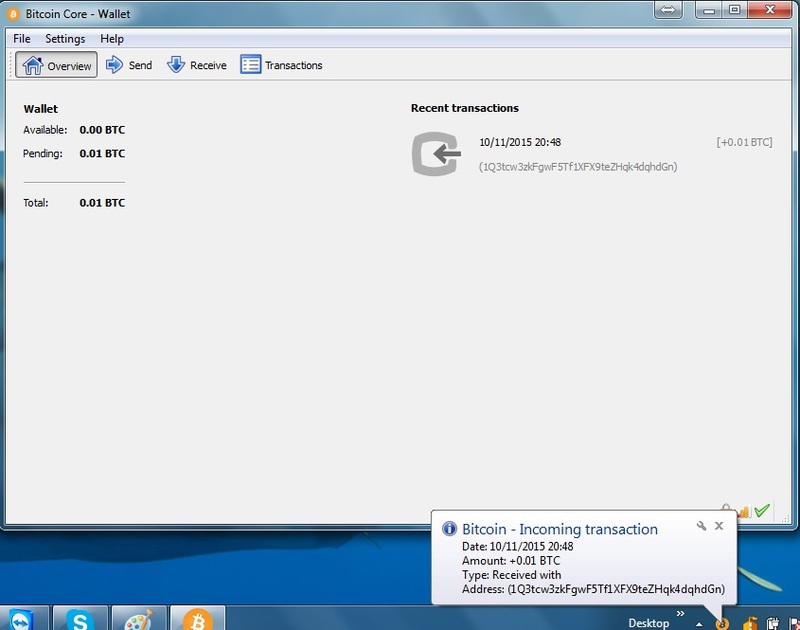 The transaction will appear as pending until Bitcoin Miners confirm the transaction. To confirm a transaction, miners have to find a new block which happens roughly every 10 minutes. Most wallets accept a transaction after 3-6 block confirmations, so the funds are completely available after 30-60 minutes. Some wallets will let you spend the bitcoins after only 1 confirmation, but it is best practice to wait for at least 3 blocks. 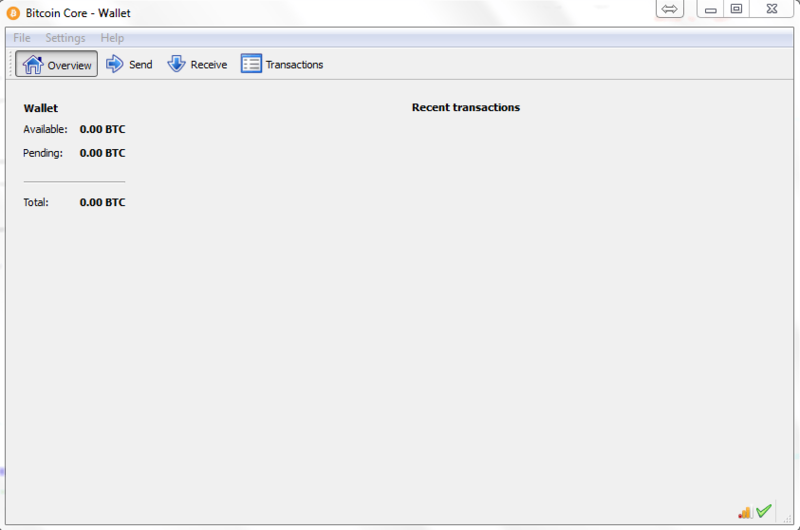 You can track the progress in from the transactions tab. I know transaction is from a trusted source (me) so I don’t have to wait for any confirmations to move forward with the bitcoin core tutorial. Note: You do not need to leave Bitcoin Core open until the bitcoin is available, miners will confirm the transaction for you even if you close the program. If you use bitcoin regularly it can be difficult to keep track of your transaction history by seeing only public keys, so you may want to create a new bitcoin address for different purposes and label them. Go back to your receiving addresses and create a new address with a label. You can create as many new addresses as you want. Some people choose to create a new address for every bitcoin transaction. Now that you have created a new address, backup your wallet file again to make sure the bitcoins in ALL of your public keys are protected. 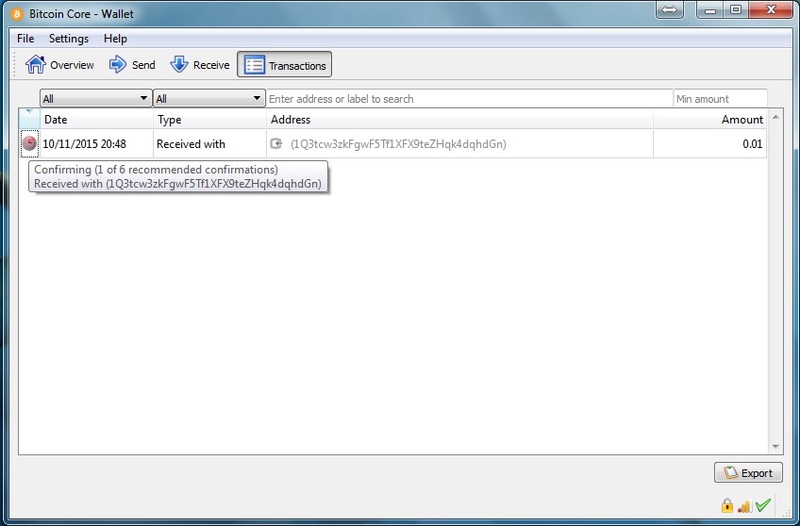 As you can see the transaction comes in labeled instead of the random generated string. This makes it very easy to accept bitcoin as payment, simply by generating a new labeled address anytime you want to accept bitcoin. 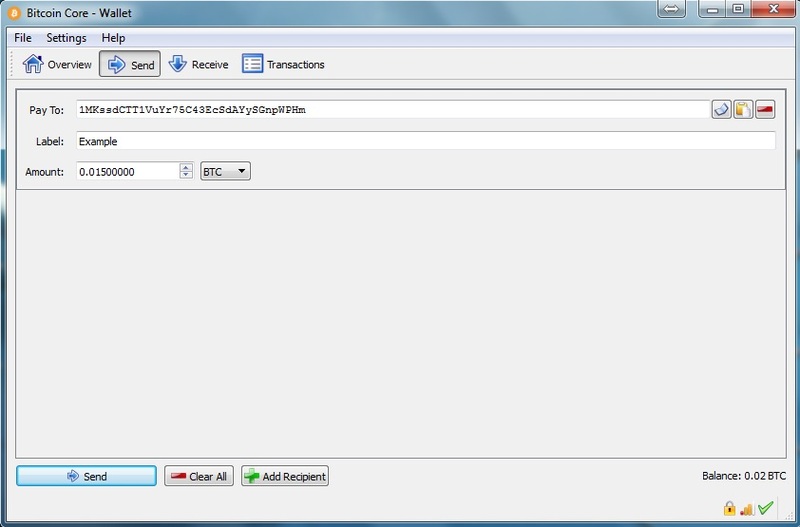 You can also see that the first bitcoin transaction has been confirmed and the 0.01 bitcoin is available to be spend after only a few minutes. If you are a merchant or service provider that is accepting bitcoin, you can use the Request tab to ask for a specific amount of bitcoin. 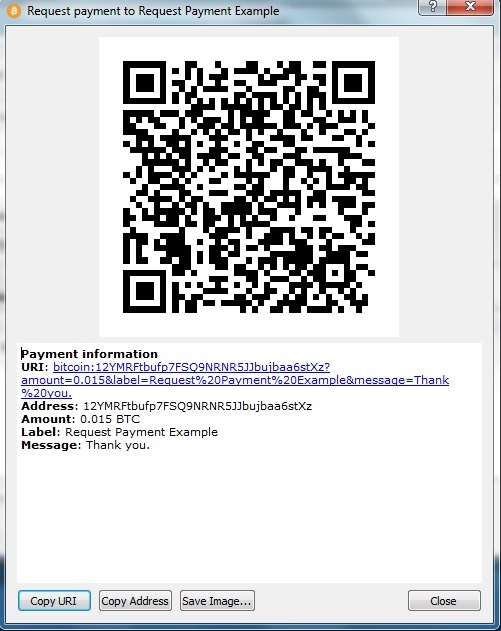 This will generate a QR code that people with a mobile phone wallet can scan to quickly send the desired bitcoin to your wallet. You should use specific information so that later you can look back and know where you got that bitcoin from. Click request payment and the QR code will be generated. If you loaded up your wallet for this bitcoin core tutorial, take a moment to find something you want to buy with bitcoin. Spendabit.co is a great place to start. When you checkout the receiving party will give you their bitcoin address and the total that you need to send. 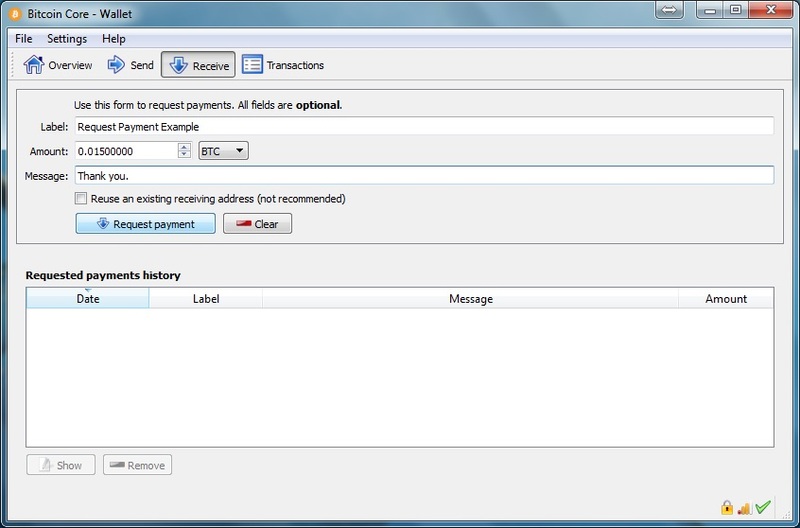 Go to the send tab in Bitcoin Core, and fill in the information. Label the transaction with what you purchased or who you sent the money to. Once you click send you will be prompted for your password. This is where you enter the password that you encrypted your wallet with. 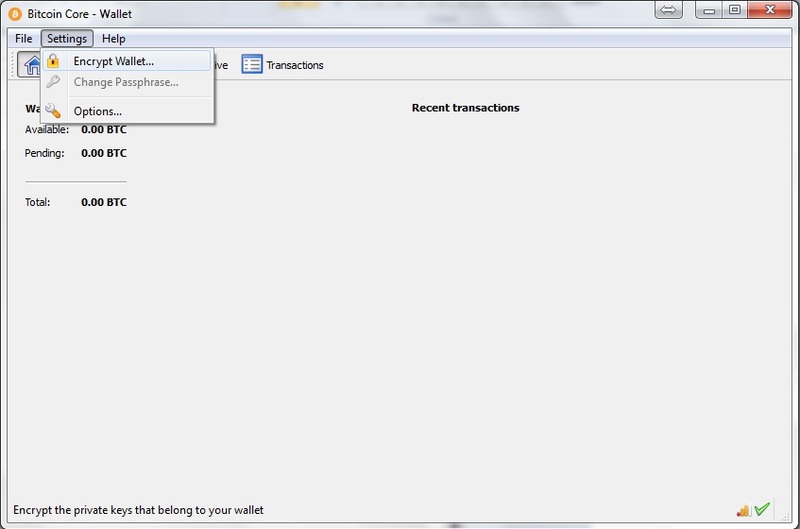 Most wallets will ask you to confirm your transaction details once more before it sends. They will also notify you of applicable transaction fees and the total bitcoin that will be deducted from your wallet balance. 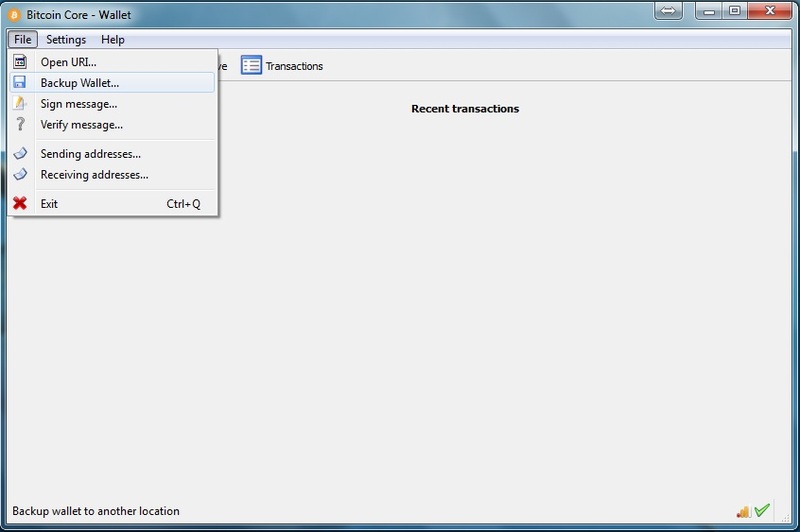 The transaction fees go directly to the bitcoin miners who work hard to keep the bitcoin network strong. You can choose not to pay a fee, but if you do they may push your transaction aside and not process it. To ensure your payment is sent quickly, pay the small fee, I’m doing it just for this bitcoin core tutorial. Right now a bitcoin transaction only costs about $0.03 USD. For that small fee you can send any amount of bitcoin to any person in the world any time you want. 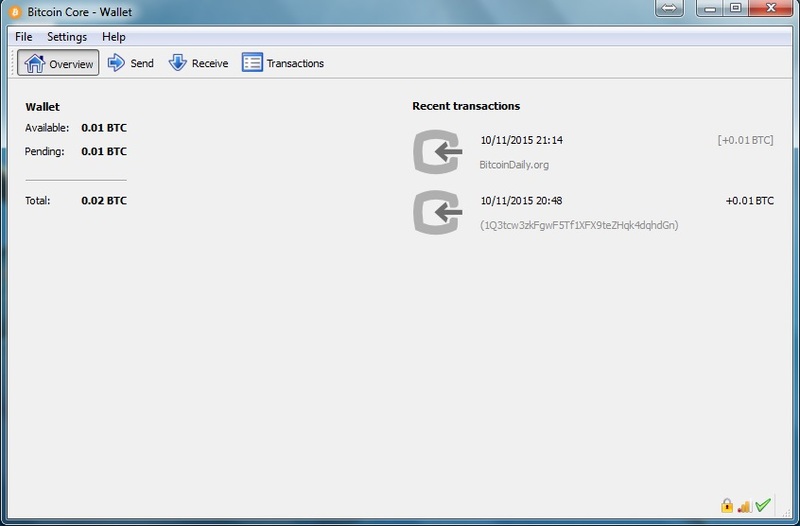 Now that you have sent some bitcoin, lets check the transaction progress. 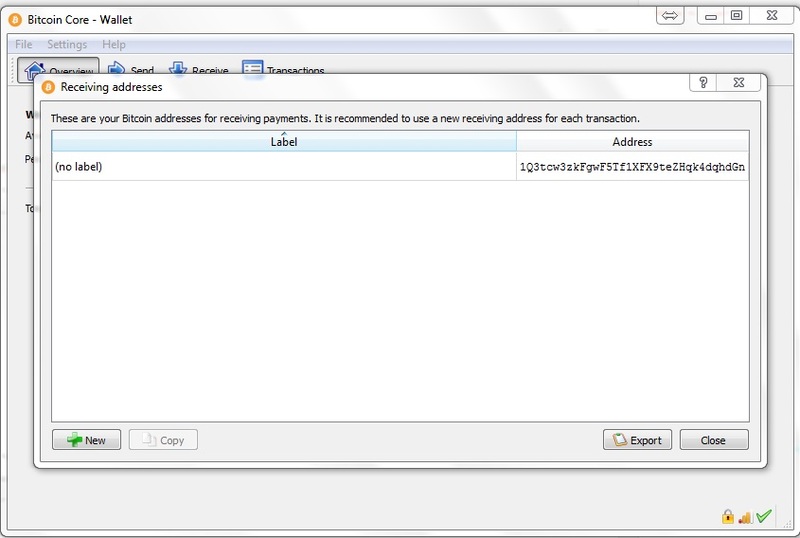 Go to you transaction page right click on the payment that you just sent. Copy the Transaction ID, then go to blockchain.info and do a search for it. 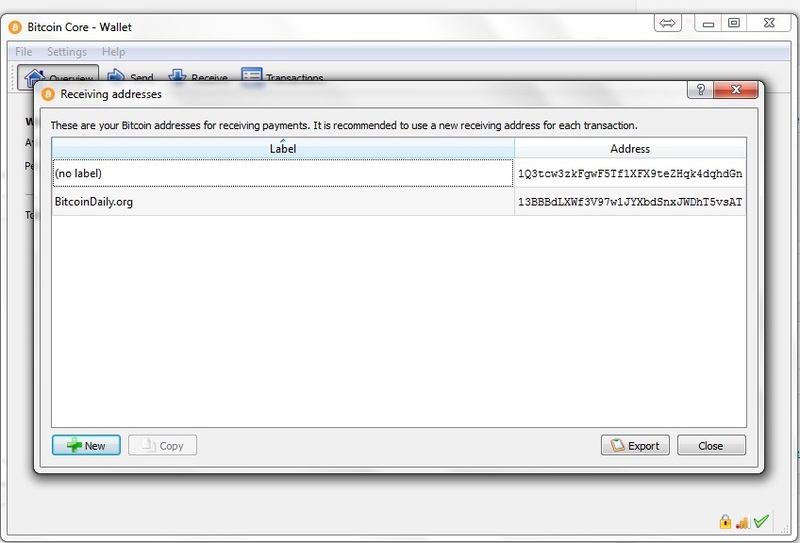 Now you can see all the details of the transaction and confirm that is has been processed. You can send this link as proof that you have paid someone what you owed. 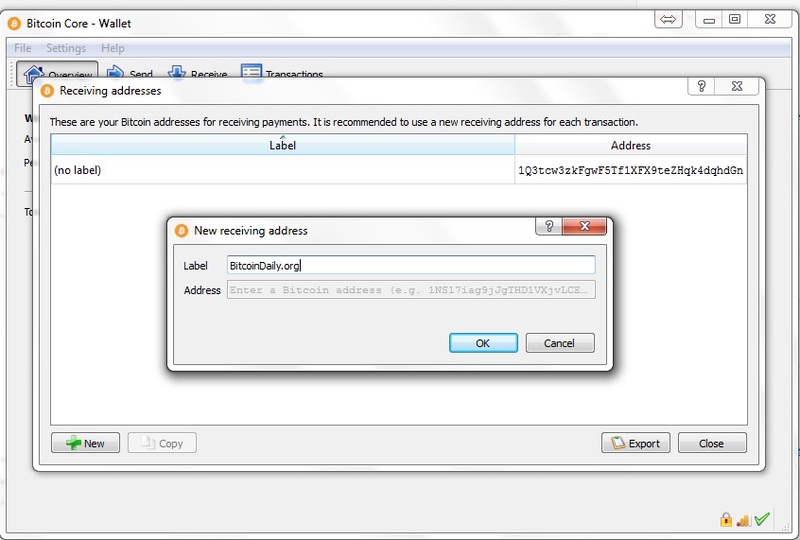 One thing you must remember from this bitcoin core tutorial is the Change Address. A change address is a newly generated bitcoin address that holds the remainder of your bitcoins after you process a transaction. This is why you have to backup your wallet again after you send bitcoins. If my wallet was corrupted and I had to restore it from an old backup, my new balance would be 0.00 BTC instead of 0.0049 because the old backup doesn’t contain the private key for my new change address. That money could be lost forever – backup your wallets. A great way publicise your website on Facebook is to create your own ‘Fan Page‘. If you are not already familiar with what one is, a fan page is a Facebook page dedicated to your business where you can inform people of everything that is happening within your company, whether that be upcoming events, promotions, competitions, new blog entries, etc. If people like your page and your business, then they can become a fan and ‘Like’ it. Before you make your first ad, there’s something that you need to understand. When it comes to the typical news feed of a user, there are hundreds of things vying for a click. There are links to different parts of Facebook in the left sidebar (messages, events, photos, etc.). Additionally, there is a newsfeed of hundreds of posts by friends and brands. All of these have likes, comments, shares and other links that can be clicked. Finally, there are ads, trending topics and friend suggestions in the right sidebar. Add it all up, and there’s a lot going on. This has an important implication for any ads you create: In order to get any attention, your ad needs to stand out from hundreds of competing elements. They all want the user’s attention, but you need to find a way to attract it and quickly get your message across. You also need to consider that a lot of your competition consists of other ads. They, in total, can take up over half of the screen at times. So, not only do you need to stand out from regular content, you also need to stand out against ads from large brands who spend a lot of money optimizing their ads to get attention. The biggest rule behind attention: It’s pretty obvious which parts of an ad get the most attention. If you’re like 99% of people, you saw the picture first. All 3 parts can have a large effect on your ad’s performance. The most important one, however, is the image. Not only does it take up the most space, but it’s also the only way you can get your ad to stand out from everything else on the screen. Your title will be a default font and blue color, while your description will be the default black font. These can’t stand out from everyone else’s, because they all look the same. But, your image can be anything you’d like (aside from offensive or banned images). Many articles will tell you that a certain type of image will perform best for you. But, they’re wrong. The best performing image is one that contributes to the message of your ad, but also stands out from everyone else’s. How to craft an intriguing description: All effective ads need a high performing picture. At this point, there’s no argument in that. The competition is just too high to profit without one. So, that’s your first priority, and it’s mostly how you stand out. However, the second place that a reader’s eye goes is your description (often instead of your title in the newsfeed). While this area won’t attract as much attention as the image, it is where you’re going to put the bulk of your message. It’s difficult to communicate a message in a picture, which is why your description is so important. It needs to quickly (in 2-3 lines) make the user interested enough to click through to your content or offer. In general, you’ll get the best conversion rate by linking to a landing page that offers a free bonus, but they’ll be relatively low quality subscribers. I would rather link to a piece of great content (perhaps one with a content upgrade), even if it has a lower conversion rate. This is because the subscribers I do convert will be much more engaged in the future. Don’t try to get clever with your description, just write the biggest benefit of clicking through to your page in as few words as possible (e.g. “Get a copy of ___ for free” or “learn how to get a 150% ROI with social advertising in this post…”). A great image gives you the potential of having a great advertising campaign, while the wrong image can ruin campaigns from the start. If you’ve ever done any paid advertising before online, you know how important targeting is to the success of a campaign. If you target the right people, you obviously get more clicks and conversions. But, if you’re showing an ad about beef jerky to a vegan audience, your targeting is way off and you’ll make 0 sales. In reality, you’ll be between the 2 extremes, but you should always aim to target only the people in your actual audience. Due to all the data that Facebook has on people, they’ve been able to develop some amazing targeting tools that are very powerful when used right. You can (and should) test different options to see which targeting methods work best for you. Option #1 – Create a website custom audience: Facebook advertising is all about “audiences” now. You need to specify the type of people you want to show your ads to. Facebook takes care of the rest. But, there are a few different ways to create an audience. One way is to create a custom audience, and I’m going to show you 2 variations of that and why it’s so powerful. 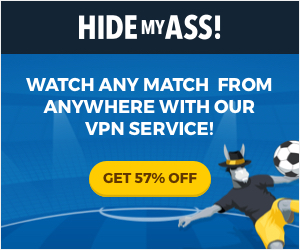 What if you could advertise only to people that know who you are, but aren’t subscribed to you in any way? It’d be great, because you already have some credibility in their eyes, right? Fair warning, this is most effective if you have a decent volume of website traffic. If you’re only getting 50 people a day, you might find that you won’t get many impressions with your ads. If so, try a different method that I’ll show you soon. If you do have decent traffic, here’s how you get your tracking pixel. That’ll trigger a pop-up with a few different options. If you don’t want to track visitors to certain pages of your website, just don’t put the code on those pages. Option #1(b) – Create a custom audience based on email subscribers: When you clicked that first blue button, there was one other really useful type of custom audience you can build. This option allows you to upload the email addresses of your subscribers and customers. Facebook matches these to users so that you can advertise to those subscribers and customers as a custom audience. There’s also one other amazing benefit of doing this that I’ll show you in option #2. For now, select “customer list”. In most cases, it’ll be easiest to just upload a .csv or .txt file (the first option). Option #2 – Find tons of people that match your best customers: This is probably the most impressive feature of Facebook advertising. It requires you to create a custom audience first, using either of the variations I already showed you. Those are powerful targeting tools. But there’s one problem: They’re limited. You only have so many people visit your website or on your email list. This can limit how far your Facebook ads can reach. That’s where this option comes in, which allows you to create a “lookalike” audience. Essentially, Facebook analyzes the custom audience you already made. They consider their demographics, the pages they like and the content they post (among other things). Then, Facebook looks at its billions of other users and finds other people who share similar traits to your original audience. This can expand your potential audience by thousands of times what it currently is. And, it’s not just any audience, it’s a potential audience that matches the type of people who are already your customers and subscribers. I hope you see how powerful this really is. To set it up, go back to the first “audiences” page that you selected from the top menu. Now, click the second blue button to “create a lookalike” audience. It’s very simple from here. In the “source” field, just put your cursor in the text box, and then pick your custom audience from the drop down menu that appears. You also have the option to specify any countries that you prefer your audience live in, too. Click the “create audience” button and you’ll now have a new audience in your account that you can target with your ads. Option #3 – Learn to target by interests, but do it well (The standard option): Those first 2 options are great for creating highly targeted audiences that typically convert really well. However, they do depend on having a decent sized audience already. But, perhaps you may not have a big enough audience yet. Until you do, you’ll have to go with the old fashioned option, targeting by interests. When you create an ad, there are a few different areas that allow you to pick options that narrow down Facebook users (that fit into it). It starts with demographic options, which consists of hard data like age, gender, location, etc. The better that you know your target audience, the better you’ll be able to fill out the demographics that you want to target. Next up are the interests, which are probably the most important part. These interests come from pages that users like, or at least interacted with. It’s not perfect, but it can produce a fairly targeted audience. This lets you be a bit more specific, by entering the pages of your competitors. Your audience will consist of people who have liked those competing pages. If you have to use this option, try to get as specific as possible. You shouldn’t have a huge audience at the end, or you’ve likely gone too broad and will have poor conversion rates. Step 4: How much should you spend on Facebook ads? As I’ve mentioned, Facebook advertising is highly competitive. Not only that, but it takes some time and practice to figure out the best way to convert Facebook users into subscribers or customers. While Facebook advertising is relatively cheap, you still don’t want to be throwing money away on a campaign that isn’t going to deliver a positive return on investment (ROI). In general, it’s best to go with CPC. When you bid per impression, you never know where your ad will show up. Regardless of which option you choose, you’ll be able to set your maximum bid per click or 1,000 impressions. You do need to be a little wary of this type of optimization, especially when you’re just starting out. If you optimize for clicks, Facebook is going to show your ad to users who click on things the most. These are usually the lowest quality traffic (but not always), because they’re always ready to click on the next thing. Regardless of which options you choose, you’ll get a suggested bid range. If you’re brand new to advertising, start on the low end of this range. The lower you bid, the fewer impressions you’ll get, but it still may be enough for you. You can always increase your bids later. There isn’t a definitive best bidding option, you should try them all out. How much will you spend? Don’t start out spending hundreds of dollars per day. Wait until you have a profitable campaign before you scale up to that. When you’re first creating a campaign, you’re asked to specify your maximum daily budget. For most people, spending $5 per day is enough to start. This will allow you to collect a good sample, over a few weeks, to determine if the ad campaign is worth trying to improve. If a particular ad is performing horribly after a few thousand impressions – scrap it. Most beginner advertisers have the wrong impression of successful advertisers. They believe that experienced advertisers put together a few new ads for a campaign and are able to achieve profitability on most of them. The reality is that most ads are losers, at least initially. The goal of your first ads shouldn’t be to get an amazing ROI, because it’s very unlikely that you will. Your goal should be to get a slightly profitable or even a break-even result. I’ll tell you why this is a good thing in a minute. They know if a campaign is profitable or not: Never start an advertising campaign without a specific purpose. You may want to drive traffic to your website. You may want to get more likes on your Facebook page. It doesn’t matter: pick a goal that you think is important. Before you get started, you need to know the value of that goal. If you’re trying to convert that traffic into email subscribers, you need to have a very good idea of what a subscriber is worth. The same thing goes for a Facebook like; how much is one worth to you? If you don’t know this, you’ll never know if your advertising has a positive ROI or not. Estimate this value as accurately as possible. You want to be able to go into your Facebook reporting, see the “cost per action” (click or like) and instantly know if you’re profitable or not. The difference between many losing and profitable campaigns: I just told you that a break-even first ad is a good thing. The reason is that you can almost always improve your conversion rates by split testing those ads. It’s pretty easy to turn most break-even ad campaigns into solid profiting ones. For example, one split test was able to lower the cost per conversion from $2.6 to $1.04. That’s a 60% decrease in cost per conversion. That’s a pretty rare improvement, but smaller improvements can be made to most ads. Split testing is very simple and doesn’t take a lot of time. You simply duplicate an ad that you’ve created, keeping everything the same. Then, you change only one part of it. You might already know this, but the reason to only test one element at a time is because it gives you clear data. After you let it run for a statistically valid amount of time, you’ll be able to tell if that one change had any effect on your results. Typically, the image will have the biggest effect, based on the reasons we went over earlier. What are the free payment gateway for WordPress sites? There are a ton of reasons why you’d want to be capable of accepting payments through your website. Maybe you run an online store and need to process orders? Maybe you want to accept donations for a worthy cause. Or maybe you want to sell digital products like plugins, themes, or ebooks? Regardless, equipping your site with this capacity can make converting customers easier. The WooCommerce extension for PayPal Pro rings in at $79 for a single site subscription. Stripe processes all major credit cards and debit cards. Plus, it also accepts Apple pay and customers can save their payment details. There’s no monthly fee, but there is a transaction fee of 2.9% and 30 cents. Both Google and Bing AdCenter have introduced a lot of changes to their ad polices for using branded keywords/phrases in ad copies. 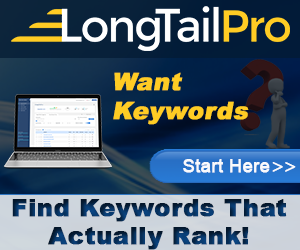 Keywords/phrases such as HP, McAfee, Facebook, Norton, Yahoo, Facebook, etc., are getting affected. Advertisers offering services or otherwise promoting a third-party product may not claim affiliation with the owner or manufacturer of the product when no such relationship exists. Advertisers must be accurate when describing their relationship with the owner of a product or service (for example if they are authorized distributors). Brands, logos, etc., may not be used deceptively, either in ad copy or website, in a way that tends to suggest that the site, product or service is owned, managed, promoted or endorsed by the owner of the product or service, unless a qualified relationship exists (parent-affiliate, certified partners, authorized resellers, etc.). Google Adwords have published their requirements for advertising on the Google Network. Four broad categories for content policies are: Prohibited content, Prohibited practices, Restricted content and Editorial and technical. Learn more about the Disallowed Content Guidelines provided by Bing Adcenter and adjust your campaign accordingly. Want to know more? 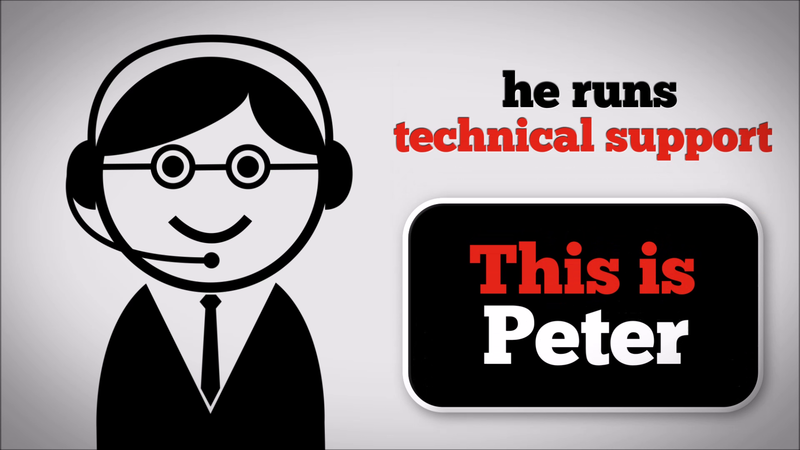 Contact us today to evaluate your pay-per-click (ppc) campaign for technical support and provide you with valuable insights to achieve maximum campaign ROI. How to Make Money Online and Offline with Paytm? Many of you might have seen the famous advertisement “Paytm karo” as television commercials. Thus, you know that Paytm is very popular site and app for online mobile recharge, DTH recharges, Movies or travel tickets bookings, buying products and lot more. Paytm is a super eCommerece store for Indian consumers. Back in the year of 2015, Paytm has established as one of the leading players in the eCommernce market in India. Thus Paytm is yet another opportunity for you to make money online and offline. After Amazon, Flipkart, Snapdeal and many other online shopping portals, Paytm has also come up with the concept of Paytm Seller Program. If you are selling your products on Amazon or Flipkart or Sanpdeal, then Paytm is yet another online shopping portal allows you to gain additional sales and chances to earn more money online. But before you move ahead and sign up as a seller on Paytm, you must understand few points before applying and selling your products. Why Should You Consider Applying For Paytm Seller? We all know in the era of the digital market, more and more people are buying things from online platforms. Paytm provides sellers a significant business opportunity to sell their products. On Paytm there are 10 crores+ customers, 60,000 merchants already selling their products under 500+ categories, and those products were delivered to more than 39,000 cities/towns. If you have less budget and can’t afford to develop and to run an eCommerce portal, then Paytm will be an excellent choice to sell your products online. # Step 1: To register with Paytm as a seller, visit the Paytm Seller Registration page. # Step 2: Entre you email address, Full name, Mobile Number, and your desired password. Click on “Sell on Paytm” to continue. # Step 3: You will receive a verification email from Paytm to verify your email address and other details. Go to your mail inbox and click on Verify Your Email Address Button. # Step 4: After verifying your email address login into seller.paytm.com access the account. # Step 5: Once you are login, account setup screen will appear, where you have to verify your mobile number. Click on Generate One Time Password (OTP) link, and you will receive OTP. # Step 6: Enter OTP in the box and click on Verify Button. # Step 7: Next, you will require entering your store and warehouse details. Add display name, business type, business address, warehouse address, order dispatch time and few more details to complete the seller registration process. Click on Continue. # Step 8: You will require providing KYC documents details. Find the list of all required and allowed KYC documents here. # Step 9: Accept the terms and conditions, and you are almost done with the process to sell products on Paytm. To sell you products on Paytm you will require Vat registration number. Though, products for sale like books, unstitched apparels or handicrafts don’t require VAT registration number. However, you can still sell on Paytm without tin, but for that, you need to prove an undertaking to obtain a tin number. In that case, Paytm will only pay you the payments after submitting proof of tin number. Given below are the required documents required to sell on Paytm. There two ways to accept Paytm payments one is using a mobile number and another one is using QR code. Let see how you can accept payment with Paytm at your local store. # Step 1: Register on Paytm by visiting Paytm.com or installing iOS or Android mobile app. # Step 2: Verify your mobile number, with which you want to accept the payment. # Step 3: Now if you want to accept the payment at your local store through Paytm, ask the consumer to open Paytm app on his/her mobile. # Step 4: Share your registered mobile number and ask him/her to tap on “Pay or Send” option on the home screen of the app. # Step 5: Now S/he will have to add your registered mobile number, amount to pay and the reason for the payment. # Step 6: Tap on “Send Money” and you will receive the payment in your Paytm Wallet. # Step 1: If you haven’t registered with Paytm, then register on Paytm by visiting Paytm.com or via iOS or Android Mobile App. # Step 2: Once you complete the registration process, it will require generating or the QR Code to accept the payment. # Step 3: Navigate to “Profile” tab in the app and at top-right corner find the QR code. Tap on it to enlarge the image. You can take a print of this QR code and place it at the payment counter. # Step 4: Ask your local store customers to “Pay or Send” money via Paytm by scanning a QR Code placed at Payment counter at of your shop. # Step 5: Enter payment amount and reason to pay and click on Send Money. All good and you will receive money in your Paytm Wallet. Is there money to be made on Instagram? If done right you can definitely make a great online income using the network. Do you have a popular Instagram and want to monetize it? Looking to start a new Instagram and later move into making some cash? I’m going to take you through all the possible ways step by step. How do you actually make money on Instagram? Getting paid for sponsored content on Instagram works for the same reason companies pay for billboards, commercials, celebrity endorsements, paid Facebook ads, and any other form of traditional marketing – you are paying for attention. The reason it works so well (at the right price) is that your message is coming from a trusted source (unlike other online paid ads), engagement and attention is higher (than anything that is obviously an ad), and there is often a clickable call-to-action through the bio link (unlike a commercial or billboard). If you want to get started as an Instagram influencer, you need to develop a niche and at least 10K engaged followers (although there are many exceptions) before it is relevant to think about. If you have a smaller following, do not worry! You may not be able to make money on Instagram, but you can take this same approach to get free or discounted or products within your niche – often before the products are publicly available. Reach out to brands you like, test out their products and services, provide value to them, build the relationship, and they may become a client in the future. How much can you make on Instagram? Through my market research and firsthand experience, the online standard has settled at approximately $10 per CPM (cost per thousand impressions). It is typically assumed that only 10% of followers see any given post. That means that if you have 50K followers, you will have 5K impressions (50K x 10%) – or be paid $1 per 1K followers – and make a total of $50 per post. However, these rates are more for raw numbers of followers. Popular influencers with online communities that put their name and reputation behind something can charge a premium for it. I have experienced a wide range, but the average influencer with a blog and/or any sort of loyal following makes 10x this amount per post. It’s the same ~$10 CPM, but without the 10% adjustment. Therefore, you can expect to make $500 for a post if you have 50K followers. This is the reason that accounts with 1 million followers can easily make $10,000 for posting one picture on Instagram. Influencers can earn even more if it is part of a brand building campaign and they are a valued endorsement. If you are part of a larger campaign, or sponsored post network (see below), the rates are usually a little lower. You can expect to earn a $2 – $5 CPM (or $100 – $250 per post if you have approximately 50K followers). There are lots of online marketplaces and apps where content creators can connect to brands to make money on Instagram. Many companies have an affiliate program that you can sign up for and promote to your community. This is the easiest, as it is typically self-service. However, this usually is one of the least lucrative ways to make money on Instagram. I only recommend affiliate marketing on Instagram if you were going to recommend the product anyway, have a massive/engaged following with a good affiliate deal that you are willing to advertise in your bio, it is an expensive product that pays a really good commission. 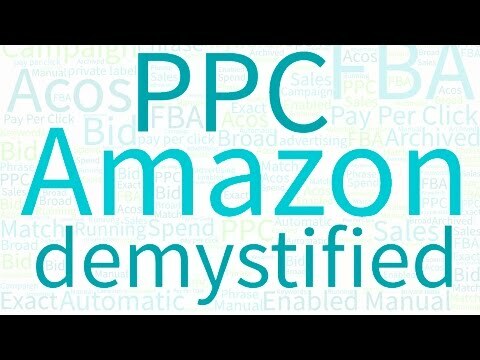 There are also many large affiliate marketing networks you can sign up for, such as Amazon or ShareSale. Product promotion is huge on Instagram because of its visual nature. If you are a retailer with your own product lines this is common sense. But it works for any business from hospitality to digital downloads. This is a really easy way to tap into the conversation. Put your ear to the hashtag scene and it will tell you ways to make money through hot topics. Making your hashtags count is key to learning how to make money quickly by grouping ideas, concepts, and trends. If you aren’t a social media “influencer” yourself, you always have the option of seeking out someone who is and asking them to help you with your mission. For a fee, they can promote your products, or join you in promoting the same campaign. You’ll quickly learn how to make money just by riding the wave they have already generated. There are a number of dramatic success stories featuring brands that enlisted influencers to help with their marketing. If you have managed to accumulate a massive following already, then you can put this kind of attention to work for you. Reach out to the marketing department at a company you are interested in or whose products you already use, and offer to be their brand ambassador. If you’re lucky they may come to you. If not, try Instabrand, Buzzoole, or Snapfluence to get connected. This option has a HUGE payoff if you can make it happen. The follower of your competitor is your potential follower. And chances are, you have at least one competitor who knows how to make money on Instagram, so you’d do well to follow them too just to see what they are doing. You can learn how to make money by the successes or failures of others in the same market. Use a tool like JustUnfollow to search for your competitor’s account by name. It will give you a list of their followers so that you can follow them and like or comment on their photos. This one is a bit like the affiliate program except that it isn’t up to you to generate the traffic. The program will figure out how to make money, and you just post the content. Just download an app like Takumi and you can start sharing sponsored posts. The only catch here is that you have to have at least 1,000 followers. That may not be possible if you’ve just starting using the platform, but if you stick with a strategy you’ll be there in no time. Are your Instagram photos top-notch? Selling photography on a marketplace like Foap is a common tactic used by Instagrammers to make money fast. All you have to do is join and start sharing your photos so that companies can pay for their use. All photos go for $10 but Foap takes half. Still, that isn’t bad. Maybe you’ve already made it to the big leagues. You’re rich or famous or both, and you have decided to go off the grid. Hey, whatever floats your boat—but you might as well make the most of it by selling your Instagram account. If you want help doing this, services like Fame swap and Viral accounts can help you through the process. These days you often hear the phrase “content is king” however this soundbite leaves out the rest of the equation. Content is king because good content increases your chances of generating high-volume traffic. We all need traffic because in the economic system of Internet, traffic can be monetized. Either directly by advertising or converting visitors into paying clients. The question is then how do you get traffic to your content. Basically you have two choices; you can pay for it or use “free” methods to drive it to your site, i.e. promoting your content using social media. When I was approached by Outbrain a traffic sourcing service I decided to give them a go to see how it compared with my usual “free methods” in terms of result and ease of use. Outbrain provides two innovative tools to help engage your website visitors and amplify your reach. The article recommendations on the netmechanic.dyndns.org/c/commsaxis website which appear below each blog post are part of the Outbrain Engage service. Outbrain Engage works on the basis that people who are reading articles are already in “content consumption” mode and therefore are ripe for suggestions about other targeted articles to read that reflect their interests. Therefore, by presenting visitors with options that match their interests they become more willing to engage and will stay longer on your website. Outbrain Engage uses a complex series of algorithms to understand your audiences browsing habits. Consequently, Outbrain is able to recommend personalized links based on each individual’s content preference. Outbrain Engage works via a simple to install widget that integrates seamlessly with the look and feel of your website and generates the thumbnail link for each recommended article that you can see below posts on netmechanic.dyndns.org/c/commsaxis. The other service offered by Outbrain is called Amplify and this does what it says, i.e. it amplifies your reach by display your content on leading, high trafficked site across the web, such as CNN, Fox News and Mashable. Outbrain has over 4 billion page views and over 70,000 publisher sites. It is the only marketing tool designed to draw readers from one piece of content to another; aka yours. You decide which articles you wish to promote; there is also the option to use an RSS feed so that new articles are automatically included. As a paid source of traffic to your website, Outbrain Amplify works best for people with both good quality articles and a large amount of content. Outbrain uses a Cost Per Click system to determine the prominence and reach of your content across their network of publishers. You have complete control over your budget because you decide how much you are willing to pay for people to view your content by setting a CPC and a daily budget. You can start as low as 10 cents per click; although Outbrain recommends starting at around 15 cents and then lowering it over time once your content becomes more popular. This ensures that you get more click for your daily budget whilst maintaining your reach so that you get the best ROI. If you can’t quite get to grips with how this works – it took me a while to understand it; Outbrain provide a personal account manager to support you. Outbrain is an extremely friendly customer focussed company. I’ve found their support to be amazing. Natalie Chan who has been working with us; has been very hands on and proactive in terms of helping identify the sorts of content that would work well on major sites and lowering our CPC. 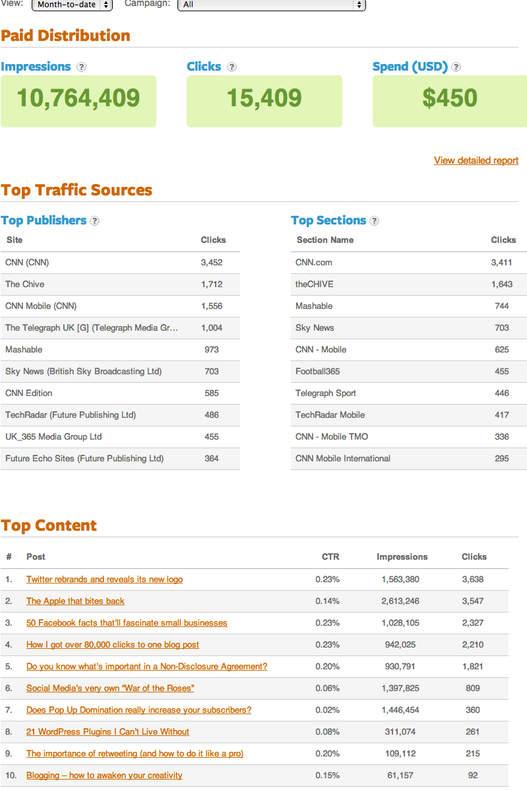 The Outbrain dashboard provides a number of different analytics to assess your campaign e.g. to gauge how users are interacting with the content on your site via the widget and if you’re using the Amplify option; where your content is being displayed and what are your most popular articles. This is the screen capture of our dashboard for the month to date (August/Sept 2012). “Impressions” are the number of times your content is displayed on the Outbrain network and “clicks” are how many people have clicked the link to view the content. Outbrain is easy to use. Once it is set up there is very little management required. Using the RSS feeds means that your content is automatically updated and you can then check how well it is doing and which titles have the best responses so you can adapt. It is great to see your content on really major sites. For example we have regularly been featured on Mashable. Guest blogging on Mashable has long been an ambition of mine; the information provided by Outbrain is a way of demonstrating to publishers that your content will be of interest to their readers. Our analytics show a marked increase in both the number of visitors to our site and the time spent on the site. We’ve used the Engage widget to reference our content. Whilst it is possible to use a plugin to show readers other posts; the beauty of the Engage widget is that by basing the suggestions on the visitors interest (assessed using their browsing behaviour data rather than topic related suggestions) the reader is more likely to click on another article. This is been borne out by our analytics. Overall Outbrain provides a cost effective method of generating traffic that complements our other strategies. Therefore, if you regularly produce fresh, good quality content, Outbrain is definitely worth considering as a method to generate additional traffic to your website. You can visit their website by clicking here. We use Outbrain for content amplification. Outbrain is used by our search team to increase traffic to website blogs. Outbrain is on a CPC model, so they are great if you want people to visit your article rather than just see an ad. Outbrain is good at helping create article titles for advertising purposes. The Outbrain platform was not user friendly in my opinion. Reporting was difficult. Many of the reports I needed, needed to be pulled by a rep.
We have shown that Outbrain increases traffic to the website and in turn can increase conversions. Outbrain’s reporting is not as robust as Taboola‘s. I have also seen better conversion results through Taboola. Though I believe it depends on the vertical you are advertising for.